Mark Carper, Binita Mahato, Maitri Desai, and Alex B. Koppelman present "The Plan: Bodies, Rest, Motion, a plan for Burnet Woods"
Over one hundred and fifty people gathered at the Niehoff Urban Design Studios in Corryville to see and hear what University of Cincinnati design students had come up with on a reimagining of Burnet Woods. The Woods, which once included the land that is now the University’s west campus, is still one of the largest parks in the Cincinnati Park system and also the central focal point of three Cincinnati neighborhoods. Both Masters and Bachlors degree students from the School of Planning at DAAP focused on the park as part of a year long planning effort coordinated by the City of Cincinnati and the university to envision a revitalized Burnet Woods. A recent study conducted by the university polled 2,000 students. One of the biggest findings from the study is that 87% of the students polled do not think the Woods are safe. Another 7% did not know it existed at all. UrbanCincy’s John Yung moderated a panel discussion on the future of Burnet Woods. As part of the event, UrbanCincy moderated a discussion panel with some of the regions’ top experts on park planning and programming. Chris Manning from Human Nature joined Ken Stapleton from Ken Stapleton & Associates and Christy Samad from Center City Development Corportation (3CDC). Panelists discussed ways to make the park appear safer including better lighting, more programming and activities and better gateway connections into the park. The hour long panel focused on a range of topics regarding Burnet Woods including a student proposal for a green land bridge between the park and the school. The bridge proposal was praised by the panelist for its outside the box approach at incorporating an aspect of the park in a way that overcomes the physical separation caused by the wide and traffic heavy Martin Luther King Jr. Boulevard. Audience members were also encouraged to participate and some voiced concerns about the park being underutilized. One participant asked about residential housing on the periphery as part of the park redevelopment noting that connecting residential to the park would be an opportunity for change. UrbanCincy media specialist Travis Estell was on hand to take photographs and record the conversation which will appear later this week on The UrbanCincy Podcast. 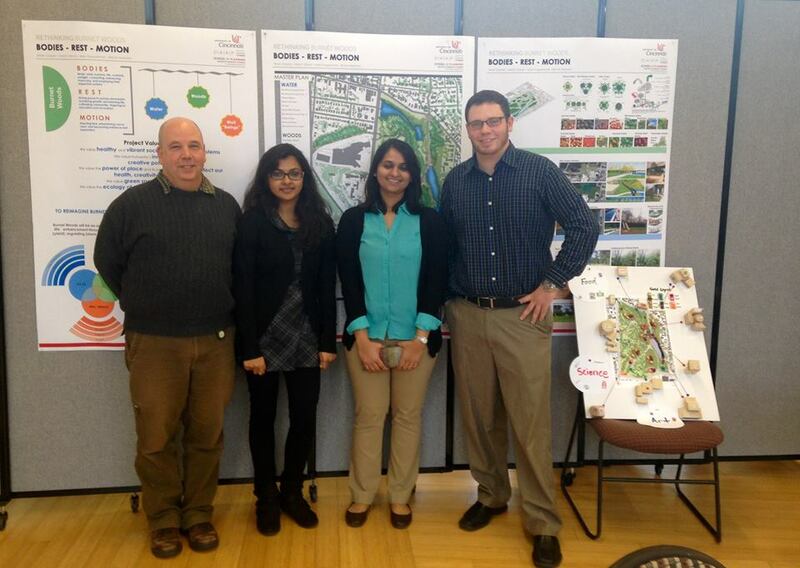 The open house was a joint event between the Niehoff Urban Design Studio, the Urbanists and UrbanCincy. Stay tuned for our next joint event in the fall!